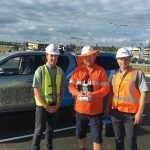 Hervey Bay Hospital reached a major milestone last week on Stage 1 of the Emergency Redevelopment project, with the handover of the new helipad and carpark from Wiley to Wide Bay Hospital and Health Service. The project commenced in early January 2017 with Wiley, who design and build facilities, being named as the head contractor. 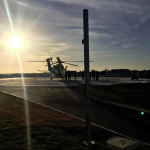 The rooftop helipad will provide direct and timely patient transfer to the operating theatres, Intensive Care Unit and the future Emergency Department. The first emergency helicopter landed last Thursday evening at approx. 5pm on the new 1,000m2 helipad with a critical patient onboard. 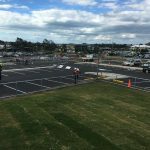 Wide Bay Hospital and Health Board Chair Peta Jamieson said it was wonderful to see the first milestones of the crucial infrastructure project become a reality. 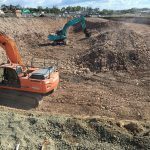 “This redevelopment is one of the Board’s biggest current priorities, because it resolves capacity issues at the current emergency department, and it builds for the future of the Fraser Coast,” Ms Jamieson said. “I’m particularly pleased to see the completion of the new car park, which is more than double the original 48 spaces planned. While hospital employees gradually filled up the new 120-bay parking area on Thursday morning, onlookers watched as the decommissioned helipad was bulldozed, allowing Wiley to begin construction of a new ambulance bay structure and roadway, and continue major rock excavation to allow future construction for the new emergency department. 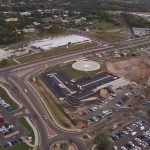 By mid-2018, the Stage 2 upgrade will see the hospital’s emergency service double in bed capacity to meet the future needs of the fast-growing Fraser Coast region, with the new carpark, helipad and ambulance bay allowing a smooth transition to meet the extra service demand. 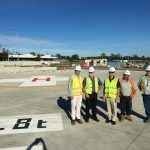 Zane Bennett (Wiley PM), David Brown (Operations & Security, QLD Health – Wide Bay), Steve Aldis (Wiley Site Manager), and Peter Heath (Director of Infrastructure, QLD Health – Wide Bay), Scott Strong (BAMS Manager) at the handover of helipad and car parking area. Civil works in action making way for Stage 2 commencement in mid-August. 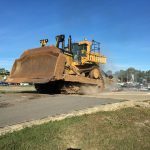 The D10 bulldozer ripping up the old helipad which was decommissioned at 8am Thursday as the new one opened. Aerial drone photograph of the site on Wednesday afternoon. In view is the finished carpark, helipad and civil works, with the new ambulance bay structure set to be constructed between the orange excavator and the existing buildings. 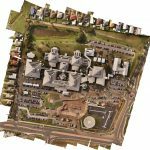 The drone zigzagged across the site and stitched together multiple photos to create this satellite-style photograph on Wednesday afternoon.